Your Best Bet For Enjoying All the Smokies Has to Offer! Why do I recommend camping as a great way to spend the night in the Smokies? - To enjoy the outdoors! It's a great combination with hiking. The smell of the trees and the birds chirping all add to the Smoky Mountains experience. -To appreciate what you have at home! We all take things for granted. You don't have all the little conveniences of home out in the wilderness. So, when you get back you appreciate them all the more. - It's the least expensive way to sleep! 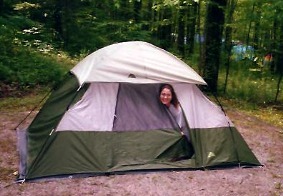 Even the cheapest motel can't beat sleeping under the stars in the Smokies! - You're close to the hiking trails. Driving to trailheads can eat away the time you spend on the trails. This way you can be closer to the trails and sometimes not even have to drive to them! Are you ready to pack up your tent and go? There's some stuff you need to know first. Check out the links below for more info.